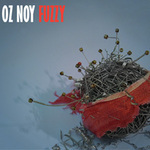 My review of Oz Noy's latest album Fuzzy has been posted at Modern Guitars Magazine. UPDATE 10/9/07: I've republished my review below. Israeli-born guitarist Oz Noy has released his strongest solo album to date - a fine collection of jazz and funk instrumentals entitled Fuzzy (Magnatude Records, a division of Magna Carta). Joining Noy on this recording are Anton Fig, Will Lee, Keith Carlock, James Genus, Jimmy Johnson, Vinnie Colaiuta, Jim Beard, George Whitty and Shai Bachar. Based in New York, Noy is an in-demand session player with numerous television, film and album credits on his resume. His solo albums are where he really gets to spread his wings though, and Fuzzy is undoubtedly his most creative effort yet. Noy's previous releases, Live (2003) and Ha! (2005) (both on Magnatude) were, for the most part, stripped-down raw productions. On Fuzzy, Noy takes a different approach. Each song is augmented with sound effects and loops to add texture to the music. As a result, Fuzzy turns out to be a very unique-sounding album. While these songs would have worked fine as straight-up performances, the post-production enhancements make things more interesting. While Noy dabbled with this "experimental" approach on his first studio album, Ha! (e.g., the scratchy, skipping record shenanigans on "Hey You"), on Fuzzy he goes hog-wild with it. The writing is different here too. A few songs still use the hard-driving guitar/bass riff approach that Noy used to great effect on many songs from his previous albums. But there's less of that style on Fuzzy. Here, Noy's writing is generally deeper than what he's done in the past. The other thing that strikes me about this album is the stark contrast in the guitar tones. Most of the melodies and chords are played with a bright, natural clean tone that is almost grand piano-like at times. But when Noy does kick in the effects, he does so in a big way that would make Tom Morello proud. Noy has a distinctive style as a soloist. Drawing from both jazz and blues influences, Noy often improvises with an "edge-of-his-seat" sense of abandon; like he's hanging on for dear life, and could lose the reins at any moment. Noy also has the impressive ability to play very fast runs with a relatively clean tone that come out strong and well defined. This is not an easy thing to do with a low-gain signal, and Noy does it well. Having said that, to me, Noy's greatest strength is his rhythm guitar work. Noy is simply one of the best funk rhythm players you are likely to hear, and there's ample evidence of that on this release. One of the strongest tracks on Fuzzy is the opener, "Which Way Is Up?!". This uptempo tune has a great melody made up of fast, clean-toned chords. Noy plays some great jazz lines in his solo on this one also. "Cosmic Background" starts out with some "what the heck is that?" backwards guitar effects before settling into its slow groove. This tune also has some of Noy's bluesiest playing on the album. "Fuzzy," "Intensity," and "EpistroFunk" are similar in style to songs like "Just Groove Me" and "Hit Me" from his previous releases. These are groove-centric tunes where the rhythm guitar and guitar/bass tandem riffs are the driving force. "EpistroFunk" is particularly good. With a rhythm section of Jimmy Johnson on bass, and Vinnie Colaiuta on drums, this highly syncopated piece is a great showcase for Noy's stellar funk rhythm guitar work. One of the best implementations of added sonic textures can be found on the ballad "Three Wishes." The subtle guitar loops than run throughout the song add a nice ambiance that deepens the experience for the listener. Another great track is Noy's version of the Prince song "Sometimes It Snows In April." It's reworked here into a great instrumental guitar piece that fits right in with the rest of this album. Again, Noy gives this track "the Fuzzy treatment" with guitar loops and sound effects, but the melody never gets lost, and his clean tone is beautiful as always. "Yeah, Yeah, Yeah" is a fairly straight-forward, mid-tempo jazz/blues song, and is the only track with no added loops or sound effects. It also contains one of Noy's best guitar solos on the album. Though it's heavily blues-based, Noy peels off some great outside lines on this track. "In a Simple Way," written by David Feldman, is a gorgeous song that sounds like something Michael Landau might come up with. This piece is a real gem, one of the best instrumental guitar ballads I've heard in some time. Noy's tone on this track is a perfect match for the chords and melody. Noy closes the album with Thelonious Monk's "Evidence." Noy's approach here is similar to what he did with the Monk classic "Blue Monk" on his Ha! album. Rife with "out there" tones and wah-wah pedal work, this is a great piece of contemporary guitar-oriented jazz. Though he's certainly a great soloist with a mature jazz vocabulary, Noy is one of those rare guitarists who will grab your attention with his rhythm playing. The highly advanced funk rhythms he can lay down are simply second-to-none. With Fuzzy, Noy has combined those chops with some great compositions and a wildly creative sense of sound and texture to create a highly original, and enjoyable album. 1. Which Way Is Up?! Agreed! I really dig this album a lot, it's one of my favorites of the year.